Redsn0w 0.9.6b5 jailbreaks iOS 4.2.1 but also provides the added ability to install baseband firmware that can be unlocked for the iPhone 3GS and iPhone 3G. For other iOS devices, redsn0w 0.9.6b5 will simply jailbreak the device but some models will be a tethered jailbreak. It’s very important to remember that the 06.15 baseband update for iPhone 3GS and iPhone 3G that is required for an update is irreversible and it will void your iPhone warranty with Apple. This is currently the only way to unlock 05.14 and 05.15 basebands. Proceed at your own risk. If you are wondering how to use redsn0w to jailbreak and unlock, you are at the right guide. This is a two stage process, first you jailbreak your iPhone with redsn0w and update the baseband, and then you unlock the iPhone 3GS or iPhone 3G with ultrasn0w 1.2 unlock. If you followed the guide correctly, you will now have an unlocked iPhone and you will be able to use it on other carriers. Devices that can not be unlocked will simply be jailbroken, some of which may be tethered. You can read the difference between tethered jailbreak vs untethered jailbreak, but essentially a tethered jailbreak requires you to connect your iPhone to boot the jailbroken device and use things like Cydia and Safari. For Windows 7 and Vista users, be sure to run redsn0w as Administrator in “Windows XP Compatability Mode” if you encounter any errors, you do this by right-clicking on the redsn0w application and selecting XP Compatability. Update: redsn0w 0.9.6b6 has been released and all those who wish to unlock iPhone 3GS or iPhone 3G should use that version instead since it will provide for better battery life. do i need to out the at&t sim before i do the procedure? hey, i don’t know if you figured it out already, but what happened to me is it just said “No Service” even though the sim was in it so i went turned on Data roaming or service or whatever, enabled 3G and then turned data off and rebooted iphone. It worked for me , good luck. Please wait while your device is being processed. There is no progress bar it is just sitting there already 10 min what should i do ? if your pc is vista/ win 7 dual core or more, open task manager, ringht click redSm0w, select select affinity, and uncheck all CPU except CPU1. you may need to fully restore using itunes (to 4.2.1) if the deivec is stuck in recovery mode, but if it is still in DFU, you may only need to run redSn0w again as above. I have tried this, but it still stays on the reboot stage!! Help I need to unlock!! I am having the same issue. 3gs 4.2.1 All above advice has been tried/ followed and redsnow still gets stuck in “waiting for reboot” stage. Try to run “as administrator”. If you have win7: right click and choose “troubleshoot compatibility” and then run in XP mode. Windows 95? It’s 2012, you’re using a 17 year old operating system and you’re surprised it’s not supported? you have to run it in Windows XP mode. Yes!! I did it, unlocked my 3gs, been locked for almost 2 months, thank you very much. i have 3gs 4.1 baseband 05.14.02.what i have to do first,upate to itunes 4.2.1 to upgrade baseband 06.15 then jailbreak using redsn0w/install ipad baseband?need help please!!!! yes u need to update to 4.2.1 1st, and it can be dl from any website. then upgrade the bb with 96b5 using redsnow and when u using redsnow u can choose to install ipad bb. but it’s risky for u bcos bb 6.15 not reversible. except the condition like mine. everything is lock and i have to force my phone to get the network working. I updated my 4.2.1 through itunes 10.1 and then do the jailbreak with redsnow, it got stuck on waiting for reboot. Can anyone help? I am on 3gs 5.15.04 baseband. Right click on the Redsnow and run in XP Compatible mode and as an administrator. Try this, it should work. updated my 4.2.1 through itunes 10.1 and then do the jailbreak with redsnow, it got stuck on waiting for reboot. Can anyone help? I am on 3gs 5.15.04 baseband. ^ same setup. It just hangs on “waiting for reboot” no matter what “tips” people have mentioned. My 3G/16Gb was running with IOS4.0.1, I jailbroken the phone (to IOS4.2.1) with redsn0w 0.9.6b5 without update to 4.2.1 from iTune. Now the phone is unlocked, but the phone works very odd, when open apps, the display looks like jumping up and down. Has anyone ran into the same issue and found a solution? Any help would be greatly appreciated. Did you ever find a solution to this problem? I am dealing with it, also. im on 3gs 4.1 fw 5.14.02 bb. windows 7.
i tried using redsn0w 0.9.6b5 a couple of times… but i noticed that the check box/warning for upgrading baseband do not show up. after every successful jailbreak i check the baseband and im still on 5.14 in which is not unlockable… am i missing something? there is no ipad baseband on there to tick? Is it also working for iPad? Last time when I have tried to jailbrake it, I got a blank Cydia icon. Do this version correct this issue? workedd perfectly for me. thnk you soo much!!! its not working in compatbilty !? This worked! I ended up having to put it in XP compatibility mode (using win7), run as admin, AND right click the process in task manager and set affinity to CPU1 (so that it only uses one processor). So anyone that’s having problems, try these steps. i did that too but while affinity Access is denied message appears. any thing i can do to jailbreak it. i have the same problemmmmm!!!! i have 3gs 4.1 baseband 05.14.02.what i have to do first,update to itunes 4.2.1 to upgrade baseband 06.15 then jailbreak using redsn0w/install ipad baseband?need help please!!!! if you want to unlock your iPhone 3GS (meaning use it on other carriers) with iOS 4.2.1 you need to download iTunes 10.1 first, and then use redsn0w to update the baseband to 06.15 – this is irreversible so you must be certain you wish to do this. You can jailbreak the iPhone 3GS without unlock and without updating the baseband. I successfully did the jailbreak and unlock on my new bootrom 3GS, using redsn0w 0.9.6b5 and the 6.15 baseband. All of that went fine, no problem- however my GPS stopped functioning completely, no GPS apps would lock onto any satellites at all. I tried resetting network settings, uninstalling and reinstalling the GPS apps ( Navigon and Magellan ), and nothing has worked. I then decided to start from scratch – restore 4.2.1 firmware, and re-run redsn0w , but that also did not work and left me in an even worse position, now the phone is stuck in recovery mode since the restore failed ( error 1015 ). I don’t have access to a mac, so I can’t use pwnage tool to make a custom firmware to restore to. What can I do? Can one of you awesome guys be so kind as to make me a custom 3gs 4.2.1 with baseband 6.15 firmware and give me a download link? Other than that I think i’m stuck and phoneless! Try tinyumbrella to kick out of recovery mode. The FW restore is already complete, you just have to kick it out of recovery mode. ;) just do a search on google. Zeeee I ran into the same problem. I got a used 3g iPhone, updated it to iOS 4.2.1 Ran redsn0w with the iPad BaseBand upgrade and then tried to fix the battery drain issues. When I couldn’t fix them I decided to start fresh and stupidly try to do a restore with the stock iOS 4.2.1 This cause all kind of problems and put the iphone in a restore loop. Long story short, I ended up using pwnagetool to create a custom firmware update and made sure to not include the ipad update. then restored that custom firmware through itunes “hit option + restore (shift on pc) ” and now I am out of the restore loop. Is Hacktivation already included in this jailbreak process? and it doen’t load pineapple or something like that.. Try doing it again. Or else, restart your system and try. Remember to run redsnow in XP Compatibility mode and as an administrator! Dear people, i successfully JB & unlock 3G V 4.2.1(8C148), BB 06.15.00, battery meter and homescreen wallpaper. suggestion: dont install multitasking, it’s make you device damn slow, and the apps cant close at all even u reboot ur device. problems i occur when i do upgrading and so on…. after done every steps in redsn0w my iphone screen keep blank. this situation can be done by using other computers or restart your own computer. My iPhone 3GS is on iOS 4.0.1, can i jailbreak directly using this redsnow 0.9.6b5 without updating to 4.2.1 in? i’ve done the redsn0w 0.9.6b5 jailbreak, bb update to 6.15.00 and installed ultrasn0w 1.2 tooo on iphone3gs 4.2.1 and rebooted the phone(tethered way).but it doesnt make much difference,but for the thing that ma phone’s jailbroken,it says restricted network(your selected cellular network is restricted.you can choose a different network in settings),give me a goddamn reply ASAP.yea…btw i’ve tried disabling 3g toooo. i did all the steps and got stuck at waiting to reeboot…need help….. I am also stuck on the Waiting to Reboot. Tried running in XP mode, run as admin, another PC, taking the cable out. Nothing works…. after i have done all the steps right! How did you do this i have done every thing followed every step but still no service or searching ?? No service or searching ??? whats going on here then any help ??? I did everything that was suposed to be done to jailbreak the phone. Dont need unlocking yet. So I ran the redsn0w and popped in the 4.2.1 ipsw file. It connected even ran the process. For some reason I turned on the iphone 3GS and nothing appeared on the welcome screen. I’m even redownloading the ipsw file again. I’ll try again with the new file. Hi. My redsn0w is a Rar zip file, so I right click on it but there is no compatibility screen. Previously i did jailbreaks with Blackra1n so I set my compatibility on windows 95, so i’m trying to change this to XP and to run it as admin.??? Extracting the file doesn’t work it says “cannot extract”. I say this because i’m also stuck on the Waiting for Reboot screen. My redsn0w also accepts 4.1 (8B117) and 4.2 ispw, why? which am i on then (can’t see due to recovery mode). Also trying to restore my phone gives me an 9006 error. Until I read this, I had already tried restoring my phone through Itunes, and got stuck with the Itunes+USB connector screen.I tried kicking it out of recovery mode using irecovery. It doesn’t come out of recovery mode even then.Now just the Iunes_USB connector screen remains haunting me. Do I have to wait for a new solution, or retry this one mentioned above? Please help, this would save me money,or I just go buy a new phone which definitely is not going to be an i-phone. Well without waiting for a reply,I just went ahead with the redsnow jailbreak and unlock procedure, checked the “Install ipad baseband” option too, but my phone doesn’t want to come out of recovery.Still shows the same infernal Itunes+USB screen.I used the 4.2.1 ipsw file, redsnow 0.96b5 but I dont get anywhere near recovery/installing Cydia etc.Any workaround? Download recboot this will kick your iphone out of DFU mode with a click of a button. You might have to install .net Frame work 4 on your system before you can use recboot. No click “EXIT RECOVERY” it will kick your device back to normal mode. i have followed no all the step to jailbreak my iPhone 3G (iOS 4.2.1), but everytime i try to jailbreak it stuck on blank white screen on my device and “waiting for reboot” on my computer. can anyone help me, please..
* Be sure you downloaded the proper IPSW file for your iPhone! Using the wrong file for your iPhone will stop the jailbreak from running correctly. This is absolutely essential. * Be sure you are running redsn0w in XP Compatibility Mode as Administrator. Mac users don’t need to do anything special. * If you’re already stuck, put the iPhone into DFU mode and then restart the iPhone by holding power and home for 30 seconds to force a reboot , this will escape DFU. Follow the instructions carefully and be sure you get the right files to start off. if u are stuck in recovery mode! not bcoz of something wrong in those instruction, but coz of a stupid mistake! how can i fix it, with the ipad basband already on the phone! ? If you are stuck on waiting for reboot your iPhone is not yet onto the iPad firmware. Just hard reset your iPhone by holding down power and home for about 30 seconds and you will exit from DFU mode where you can reboot and try again. I have an iphone 3gs with bb 05.11.07 on ios 4.1. any idea what should i do to update to 4.2.1?? iphone 3g jailbroken and unlocked on 4.2.1 ? 2. Launch Itunes, shift/option restore choose the 4.2.1 custom firmware (you can make it using pwnage tool or i can send it to you), the phone should restore without a problem from there! id be so glad for ur help ! could you send me the 4.2.1 custom firmware as i don’t have access to a mac? that would be greatly appreciated. my email is peepeejay@gmail.com. thanks! please can you email me the custom firmware for 4.2.1. I have exactly the same problem stuck in recovery mode and cant restore as getting 1015 error. Ahhhhh!! Hi Melissa, Could you please send me the file/link for the custom IPSW? And for those who have just a white icon as cydia on their screen just open redsn0w click on just boot and after the phone reboots you should have the normal cydia icon on your screen! Good luck, i just got mine working after two days of recovery mode!!! I tried the tips for re-jailbreaking iphone 3gs 4.2.1 with 6.15 base band, but its a no go for me. I keep getting a white screen when I try rebooting it with tethering, and it goes no where. I hard reboot it and try again. I tried re-doing the jailbreak, still no go, got the white screen when it tried starting up. I then tried to just boot in DFU mode for a custom 4.2.1 install, itunes rejected it giving me an error 28. I’m at a lost here. Phone keeps booting with a white screen when I try anything, and when I just hard boot it, it puts itself back into DFU mode automatically. I had a similar problem with redsn0w when updating to 4.1/4.2 on my iphone 3gs. I received the white screen at times, or else the ‘waiting to reboot’ message. I also had a problem in iTunes where TWO iphones popped up when only ONE iphone was connected. To fix the problem, I found a simple solution: reboot your mac into “safe mode”. Then try redsn0w. It worked the very first time! To get into safemode, reboot your mac, and when you hear the bootup chime, press and hold the “shift” key for awhile. Once it appears to be doing something different at startup, let go. On your login screen, it should say “safe boot”. Hey guys with the white screen stuck while installing Custom Firmwares or similar. I am so happy to be having Tinyumbrella saving my old SHSH. So I could downgrade to 3.1.3, which was saved actually. And then it worked and I could install my 4.2.1 again! I jailbroke my iphone 3gs using redsn0w and was successful. when I went to unlock it with ultrasn0w i accidentally rebooted it without using redsn0w. it has been stuck on the apple logo ever scene. I’ve tried a bunch of different things but nothing seems to work. PLEASE HELP… I don’t know what to do at this point. made with pwanage tool for 3g. Please send me sajmeri@gmail.com if somebody has it. after using the methods above, my 3gs is locked into the recovery mode. how can i kick it out? I am stucked now…. pls help. We do not provide custom firmware. You are welcome to download Apple’s firmware. Do i need a at&t sim to unlock iphone 3g?? because once i upgraded to ios 3.1.3 i was stuck in emergency call mode…in iphone 2g..
so I downloaded redsnow. I upgraded to 4.2.1 but when I browse for the 4.2.1 using redsnow I can’t find the file! where am I supposed to look? when I upgraded thru itunes it did not give me an option to download the firmware in a specific place where I can always retrieve it at my leasure.. help! You have to download the ipsw file separately from the iOS 4.2.1 update via iTunes. Just follow the instructions, it tells you exactly what to do. Hey guys, any of you have problems getting the ISPW icon with the download? I have tried using itunes and Redsn0w and they both cant find the ISPW. What am I doing wrong? i was so sick of my 3g running slowly, followed instructions worked flawlessly! nice to have it operating properly with no crashes. and being on the up and up with the new ios is nice too. THANX GUYS AWESOME WORK ON THIS ONE! hey got a iphone4 the other day and it wont turn on at all. Screen is completly black. The person i got it off had it on aplan but let it run out. new to this so if someone has had this problem and could help??? iPhone 3G. 06.15 baseband. ultrasn0w and redsn0w on 4.2.1. Lost GPS functionality, it will not pinpoint my location any more. Worked just fine before the new JB. Any fixes? To jailbreak yes, but it will not unlock. Hey i got ios 4.2.1 on my ipod touch4g. I jailbreaked it without errors and opened cydia. It said that i had to do some updates so i did. Then my ipod rebooted but it is a tethered but i didnt have to libk with my pc. I opened cydia again but it closed immediately. Safari wont open also. Can someone help me plzz? You have a tethered jailbreak, you need to boot the iPod touch as tethered from redsn0w again in order to use the jailbreak apps like Cydia. Safari is the same thing. You can boot the hardware without tether but the apps won’t work, if you boot tethered, the apps will works. This is how all tethered jailbreaks work. The first time i rebooted cydia wasna white app. After that reboot it was normal brown with the box thing. Then i needed to do some updates and now i have to reboot again? Redsnow > select firmware > install ipad baseband checked > finish successfully > iphone rebooting > s.t.u.c.k !! Now i am at the Apple Logo and it wouldn’t go any further. Force reboot by holding down power and home button, same result. Any suggestions? I have a 3G on 4.2.1 baseband 05.15.04 which has been unlocked by the carrier. Prior to that I had used the jailbreak for 4.2.1 with no problems. However to apply the carrier unlock I had to do a restore, so it’s now stock 4.2.1 again. The question I have is if I jailbreak (without the baseband upgrade) will I lose the carrier unlock ? Well in the absence of a response I tried it anyway and the official carrier unblock stays in place and the phone is jailbroken for anyone else with a similar question. Thanks Steve. Exactly the answer I was looking for! the progress bar successfully turns into, “waiting for reboot” but after a few seconds, the redsn0w program keeps freezing up, anyone help please? hello im really stuck and would appreciate any help!, i just got this iphone 4 for christmas and its was running firmware 4.2.1 i needed to unlock it so i searched on google and found this, i jailbreaked and unlocked it and was installing something on cydia that required a reboot, i rebooted once and then on redsn0w selected right option ( boot to something) and it worked, then i did this again, but now my iphone is stuck in an apple logo/recovery mode loop, is not recognised by itunes and ive tried 1 million ways im desperate for help!! (i think my baseband is the 6.15.00) thanks!! Restore it, and just jailbreak. It’s tethered for now, meaning you’ll need to boot with redsn0w each time. I have a 3GS (old bootrom – 38th week) with the 05.15 baseband on 4.2.1 and Redsn0w always completes successfully… but I never get Cydia or the change of baseband. I tried it about 5 times. I read about someone getting it on on the 4th try, do I have to just continue trying it or is there something that I’m missing? How do I run in Xp Compatibility mode in Windows 7 Home Premium? According to Microsoft, I can’t download XP and Virtual PC. And when I right click on Redsn0w, I only get an option to run as Administrator, not in XP. Redsn0w starts to download Jailbreak Data (on iPhone screen) and seems to get stucj uploading Ramdisk. I’m sooooo stupid. Found the XP compatibility mode under Properties after right clicking on the .exe. Sanford, I’m guessing it worked for you? I made a post right before you, still no luck. I figured it out, I’m on a quad core PC so I had to open up task manager, go to processes and limit Redsn0w to CPU1. Now I have another problem, I tried to restore my phone again to a backup that I had so that I can gain pictures and contact buts iTunes is giving me error 1015. I believe it’s because of the baseband change, is there a way to restore it again with the new baseband or am I out of luck cause now all I get is the iTunes/USB Image on my iPhone? Works like a charm, thank you. Can use my old iPhone 3G in India! HI… evry1 m from Pakistan.. hving Iphone 3G with IOS 4.2.1..
I’ve successfully Jailed and Unlocked my Device. Had some issues with redsnow in Windows 7, for those having booting up issues try to use redsnow in XP SP3, i tried and got the result. Updated my Base Band and also unlocked the carrier. Hats off for the Dev-team. im using windows xp.. do i have to change the compatibility of the redsn0w? like in windows7, they have to do the compatibility with xp…. what’s that iPad baseband for? I have read through all the questions and responses and have tried everything including renaming the apple firmware file with a ipsw extention, but I have no luck. When running the redsnow program, it does not recognize any apple firmware. I am trying to jailbreak an Ipad with a 4.2.1 IOS system. Please help. my phone is stuck in recovery mode. using redsn0w i successfully upgraded my baseband to 6.15.00 but while trying to use Cydia my iPhone crashed and it’s been in recovery mode ever since. it’s an iPhone 3GS running iOS 4.2.1 and the first 5 digits of its SN are 88936. because these are not over 40, i said it was an older version in redsn0w. if i try tiny umbrella to kick it out of recovery mode this works briefly, but it goes directly back in. i’ve also tried rebooting tethered through redsn0w but this only results in the pineapple appearing for a few seconds then going back into recovery mode. and if i try to restore to my custom ISPW in iTunes, i receive error 1015 even after using redsn0w to enter DFU mode. fyi, Cydia crashed after i tried to turn off airport mode and turn on my wifi. i need my phone jailbroken and unlocked so i can use it abroad. also fyi, the other mistake i may have made was not running redsn0w as an administrator. this doesn’t really make sense, though, since the jailbreak was pretty successful. it was only when i tried to unlock it and Cydia crashed that i encountered problems. i’ve also since tried running redsn0w as an administrator and loading in DFU mode to restore but this is unsuccessful. the iPhone has the USB and iTunes image on it. Hello Guys, great stuff here. ‘Did not find repository. The indicated repository could not be found. This could be because you are trying to add a legacy installer repository (these are not supported). Also, this interface is only capable of working with exact repository URLs. if you host a repository and are having issues please contact the author of cydia with any questions you have. Have you tried putting a ‘/’ at the end? That’s what I had to do. i tried redsnow 9.6b5 to jailbreak and unlocked and unlock my iphone 3g, its working fine upto boot-up then my iphone is not bootup forever. i dont know whats going wrong. i tried all posible way but could not succed. it only shows apple logo.can anyone help please. Okay, so I did everything and it seems to be working. But I’m about to switch to T-Mobile. Do I just instert the T-Mobile SIM card and it will automatically work? Like it’s unlocked and jailbroken. And I’ve downloaded the ultrasn0w from Cydia. Hey, I have redsn0w 0.8 unlocking and Cydia installed on my 3G. Is 0.9 an entire re-install of redsn0w and Cydia to make it unlock? Hello, please could you help me? I have an iPhone 3GS in the firmware 4.2.1. It was in the 5.12.01 baseband. I tried to jailbreak and unlock it using redsn0w. After ir I entered in Cydia and installed ultrasn0w. After rebooting the system, my iphone keeps locked in apple logo and then after a few seconds it turns to recovery mode! I am using Tinyumbrella but it is not working! Every time my iphone goes back to recovery mode! I have the iphone 3G iOS 3.1.1, (jailbroken and unlocked With T-mobile) and i want to update to 4.2.1 and jailbreak and unlock. CAN I JAILBREAK WITH THIS “HOW-TO” TUT. I HAVE BASEBAND 5.11.07???????? i have a iPhone 3Gs iOS 4.1 jailbreak with l1mera1n. but now i wanna upgrade to 4.2.1 and jailbreak it using redsnow. will it be the same? and also. if i jailbreak with redsnow. will it definitely be a tethered jailbreak? I have researched jailbreaking cause I didn’t want to mess up my phone. Wikipedia says how legal it is and even shows the phone model and which version of software to use. I didn’t have time over the holidays but when I checked back, Wiki had updated to newer redsn0w versions. Everything looked so easy that is until today. None of the ones that are supposed to work for iPhone 3G/S are able to be downloaded from any site I can find. Either the site is not found or it hangs. I think there was a problem discovered and it has been pulled. Can anyone verify? ive just download the right iOS 4.2.1 IPSW for 3g and redsn0w.. but still ive got the same result on DFU mode.. stuck on “waiting for reboot”! i try this one but still same result… stuck!! and then used ultrasn0w through cydia to unlock. Its been working fine till yesterday. My brother tried to restore it using itunes and halfway through the process he pulled the cable out so now, everytime i switch on the phone, it shows the “connect to itunes” symbol. Can you please help me to fix this?? Sounds like your phone is stuck in recovery mode. Try downloading recboot, http://osxdaily.com/2011/01/12/recboot-makes-recovery-mode-easy/ run it this should kick your phone out of recovery mode. when running recboot it might ask you to in stall .net Frame 4 first http://www.computing.net/answers/windows-xp/net-framework-v4030319-free-full-download/187771.html This should get your phone out of recovery mode. Can someone please please help. I jailbroke and unlocked my iphone 3G running 4.1. I ran fine on the IPAD OS. Through a dumb decision, I RESET my phone to erase all previous user settings,which put it into a coma displaying the apple logo. so i tries to restore using itunes, but that didn’t help. I tried re-installing the IPAD OS but nothing. Any ideas, or to I just chuck the phone? Supper worked on the second try both the jb and unlock, had to remove the AT&T sim. will push service stop working if i unlock my iphone 3g using ultrasn0w? ok, so please noob question here. But I already ran greenpois0n to jailbreak my phone. Do I also have to run REDSN0W to unlock (to use diff’t carrier besides AT&T) or is the greenpois0n jailbreak ENOUGH ? Any help would be appreciated. lordwafer AT hotmail DOT com or respond here. THANKS. By the way, if anyone is having trouble with this, try a different computer. I was trying to unlock my 3GS using my MacPro desktop for TWO DAYS with no luck! so just to make it clear… with this i can use any carrier for my 3g iphone? like i could actually use my simple mobile sim card on my iphone with this? I have iPhone 3g, 8GB (Jail broke & Unlocked) version 4.1 and baseband 6.15.00 and Windows 7 and now i want to update it to version 4.2 so can anyone tell me whether i first have to update it from itunes or not? from where i can get custom ipsw 4.2? I tried directly jail breaking with 4.2 IPSW from redsnOw i.e without updating from itunes but nothing happened the version of iphone is still showing 4.1? I would really appreciate if anyone can help me with this. I have an 3Gs and installed a IOS 4.2.1. Can you help me to reinstall 4.2.1 in my iphone 3Gs. I already have 4.2.1 SHSH but I don’t know how to reinstall. Please hlep. Thanks. I have an 3Gs and installed a IOS 4.2.1. Can anybody teach me how to reinstall 4.2.1 in my iphone 3Gs. I already have 4.2.1 SHSH but I don’t know how to reinstall. Please hlep. Thanks. i updated my iphone 3g to ios 4.2.1 and jailbroken it using redsnow 0.9.6b6.now i erased my iphone content and settings from settings menyu.now i try restore the same version using itunes and restored but i unable jailbreak it.during jailbreaking process everything going fine but jailbroken.help me. I have installed ultrasn0w 1.2 from within Cydia, rebooted my iPhone, plugged in my t-mobile SIMM. It shows “searching . . .” for ever on top let corner. Did I miss any steps ? i got the same problem mate when i put a new sim card it showing no service what should i do please help me any one ? my iPhone keeps jumping in recorvery mode.. what can i do? Thanks a lot who have posted this…i really thank you you are doing a great job keep it up as this world needs people who can make others proud….nice one mate.. It works! nice job man..thanks! Worked excellent, Jailbroke and Unlocked in 10 mins. Thanks. Great Work. hi all i followed this guide step to step last week and confirms that it works, unfortunately there is a downside, my iphone 3g on 4.2.1 8c148 now has developed a gps fault due to the unlock phase it barely works and when it does it places me 100 miles out. I want to jailbreak and unlock it but have not been able to using the above method. The redsn0w program quits when trying to change the baseband. it will jailbreak with no problem but not update the baseband. Ive tried it several times and have used different profiles on my macbook pro and its always the same, jailbreak no problem update baseband just doesn’t seem to work. Has anyone had this problem? Am I doing something wrong? Thanks I’m tired of the restore process please give me some insight! hello i have a iphone 3g on os 4.2.1 with the bb 5.15. I’m new to all of this, so any help will be GREATLY appreciated! I am trying to run the unlock/jailbreak for iPhone 3G running 4.2.1 on a Mac 0SX computer. I get through all of the first steps running redsn0w, but then it gets to the “fetching iPad baseband files please be patient” window. The window suddenly just disappear, nothing else comes up… and when I try to turn on my iPhone and I have to hold both home and power buttons to even get it to turn on… then it says: that since there is no valid sim card it can only make emergency calls. It seems like redsn0w did not work to jailbreak it? I’ve tried running it a couple of times with the same results. Suggestions? I’m in China, so I don’t have any US SIM card to use. what if i dont want to change the baseband? i have windows xp and i m jailbreaking ipod touch 3g 4.2.1. I had some troubles getting this to work. I used the newest redsnow 0.9.8b7b on my windows xp. when redsnow accepted the Iphone the process took about 2 minutes before redsnow let the phone do the rest. The iphone rebooted about 3 minutes after that. Nothing works! Have iphone 3g 4.2.1 tryin to jailbreak and unlock on windows 7. The link for 9.6b6 states the download page no longer exists!!? Then tried redsnow 9.87b everything seemd to b working great (rebooted, installed packeges, etc) now my iphone seems to be frozen on the black screen with white apple sign. Any suggestions or similar problems? For iOS4.2.1. when running redsn0w 0.9.6rc16 and jailbreaking you must run the “install cyndia” and “install ipdad baseband” seperately. thanks for the tips BJG it works on mine. attempting to do this on a 3G but when i run redsn0w there is no option to check ‘ipad baseband’. how do i resolve this? Very useful for my Iphone 3g…. and easy, thanks! My iphone3G jailbreak done. Reboot after apple logo is loading many times. how to show screen iphone main window? can someone help me? redsnow always closes on me during its fetching of the ipad baseband files? Wat versionof red snow? Wat iPhone and baseband and firmware you running? open iTunes, press shift and restore and select the ipsw you downloaded. Retry redsnow and make sure you go to extras tab first( depending on version of redsnow u have and select ipsw. Worked for me like a charm…Awesome method to unlock guys..
but Please help i have one problem..
when install my bsnl sim tethering option is not there..
having trouble with ultrasn0w. can only download 1.2.4 now and then i’m getting no service after i unlock and reboot. no luck thus far. any help? I am trying to run the unlock/jailbreak for iPhone 3G running 4.2.1 on a Mac 0S X lion computer. I get through all of the first steps running redsn0w, but then it gets to the “fetching iPad baseband files please be patient” window. The window suddenly just disappear, nothing else comes up… and when I try to turn on my iPhone and I have to hold both home and power buttons to even get it to turn on… i downloaded forecast to check my iphone to unlock it ?it says jailbreak yes ,but for unlocking, it says no I’ve tried running it a couple of times with the same results. any suggestions . can i unlock this iphone or no? It worked with the 3G, What could have gone wrong with the 3GS? I followed the instraction and jailbreak and unlocked my phone and it still says unable to load network list. please help me!!!! I have an iPhone 3g and I just upgraded to 4.2.1. Everything worked; however, my screen is very jumpy. Does anyone know how to remedy this problem? im stuck at the pineapple shape. I am using iphone 4s version 5.0.1. i want to activate it but don’t know how because if i try jail breaking via absinthe it says your phone is not activated. any one can help me? I succesfully jailbreaked and unlocked my iphone 3G 4.2.1 but i found out my device was running very slowly and my springboard was crashing all the time. So I thought i’d just have to jailbreak my iphone again, maybe that would help. The iPhone 3G with iOS 4.2 is pretty slow in general unfortunately, the best iOS for iPhone 3G is probably 3.1, the speed has nothing to do with the baseband though. Hi I have Iphone 3g base band 6.15 and running on 4.2.1 but it crashed due to some cydia tweeks now I want to install a new 4.2.1 firmware on my iphone 3g but I’m afraid like last time when I jailbreak my Iphone to 4.2.1 it locked and needed a valid sim to unlock can anyone tell me how to unlock my Iphone after jailbreak to use my homescreen and use cydia????? Ok, If I remember correctly, This version of redsn0w was suppose to support MC models, but I tried it and it still says it doesnt support it. Thanks! My old 3g is reincarnated to a new life! Did the deed in an hour, no problems at all. The dev crew is stunning! Stunning ,I say! Thanks to this site. I unlocked my iphone 3G by upgrading its baseband. 1. remove SIM card while jail braking. 2. Once Jail break done put your phone in Air plane mode and restart it. 3. after it got boot up make sure you insert a SIM and get out of Airplane MODE and wait for 5 mins. hey i did al of the right things and now it says waiting for activation this may take a while however it has been about on hour is there something else i can do ?? any clues? I have an iphone 3g, i was trying to follow ur steps, but by mistake i install the ipad baseband. Now when i accessed to itunes it asked to restore the iphone, i did it, but now the only thing that i get it’s a black background with the itunes logo and an usb cord. I’dont now what to do… Can somebody help me???? i think u restore it to 4.2.1! if u do so then u should again restore it to firmware 4.1 because now iphone 3g is not restoring on 4.2.1 so restore it 4.1 then jailbreak it! I browsed th ipsw and then did the all steps. put your iPhone into DFU mode then the screen said be patient and then the Screen itself vanishes i tried it 3-4 time but same every time. Please help me to unlock my iphone. pls help wen jailbreaking starts redsnow suddenly close down………. a msg is shown that”redsnow has encountered a problem we are sorry for the innconvinience”………….. This worked like a charm! Thank you sooooo much for the detailed description – couldn’t understand everyone else’s articles with all their tech talk! FINALLY SUCCESS!!!! For two days I struggled to jailbreak an iPhone 3G. Actually, I was re-jailbreaking it after a clean install of 4.2.1. No matter what I did, whether greenpoison or redsnow, I couldn’t get it to complete the process. Then, remembering I had succeeded with the very same phone before on a Win XP machine, I dug out an old laptop running XP (with iTunes), and TADA! PROBLEM SOLVED!!!! I’ve tried repeatedly to follow the instructions for my iPhone 3g 4.2.1, but when I get to the stage where I’m to put it in DFU mode, redsn0W stops well before the final 15 seconds of Home button-holding, starts to process something, and then just closes everything out without completing anything. Am I doing something wrong? And I’m running this on a Mac. Find a computer with windows xp. Several days after posting about jail breaking a 3G on an xp machine, I was approached by somebody else needing to jailbreak a 3G who was unable to do it with Win7. Once again, using an xp computer with iTunes (iTunes provides essential drivers) and redsnow, everything went perfectly the first time. To jailbreak a 3G phone, nothing beats doing it on windows xp. Thanxxx a lot! <3 Finally I have jailbroke my iphone 3g! It worked! I plug mine into Itunes and it works fine. It will work until you do an update in your Apple software. that’s the sperit of the community helping one another so in doning so i don’t want to be one of those poeple who profit from the other’s generosity and then get away with it. Long story short, i want to pay tribute to all the Dev poeple who did and still doing a great job, so keep up the good work. PS: to the poeple who are stuk in the “Please wait while your device is being processed” i did all the steps that are aforementioned but nothing happen, so i just removed the sim card from the iphone and everything went just fine as the tutotial said, so i hope i helped even a little those who are in the trouble of JB thier iphone. I am an older mother of 2 and I was able to do this first try for my daughter’s iphone :) Great directions! iphone fully jailbroke but ultrasn0w dose nothing for it at all done the ipad BB nothing i can even downgrade my BB to 05.13.04 still nothing i do not know how you managed to do this i followed every step 1000 times over and still no signal no service searching when i finally get 1 signal bar i hit the phone icon and as soon as i do signal gone back to searching then no service i dont get it at all. Please help me out here 10 days and nearly 16 hours still nothing at all. Hi! DavieSta..Did you manage to resolve this issue on ur iphone?Coz Im having the same problem..Can you get back to me please…. Manage to make this procedure hope this works for you..
2) update firmware to 4.2.1 from itunes. 4) unzip redsn0w and run as Administrator. 5) browse for ipsw firmware 4.2.1 then click next. then run again redsn0w and check install ipad baseband. 8) click next the follow intructions on entering recovery mode. install ultrasn0w from cydia through the source repo666. Download iReb.r6.exe to get out from recovery mode. Note: If firmware 4.2.1 will not work on your iphone…. 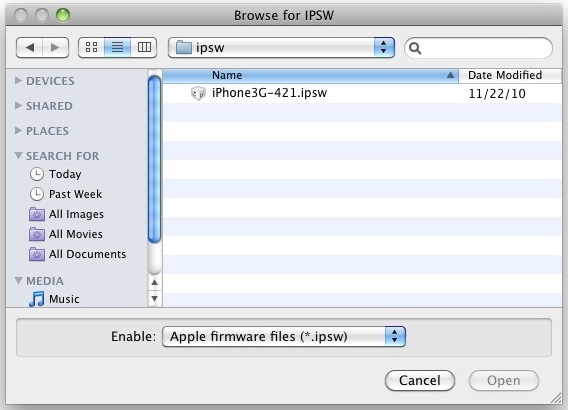 10) Download firmware ipsw 4.1 for iphone 3G 3Gs. 11) Run redsn0w again and select firmware 1.4 ipsw then follow steps as before. Procedure in installing ultrasn0w without wifi for unlocking iphone with carrier. then unzip ultrasn0w 1.2.7 on your desktop. Note: If Cydia is not available in Media…Just add folder and rename it Cydia with “C” uppercase. then from Cydia folder make anew folder also and rename it AutoInstall with “A” and “I” uppercase. 4) restore your iphone from the back-up on your itunes. Done…Enjoy your new updated iphone 3G 3gs..
What if redsnow is unable to recognize specified IPSW? Help! iv jailbroken and unlocked my iphone 3g 4.2.1 however i still have no service when i put sim card in. Please help iv seemed to tru everything and just cant get service. Finally I have jailbroke my iphone 3g! It worked! when i put the source url in it says its unable to read source list… help? hey will this download give me a virus? ?